Look what arrived in the mail today! 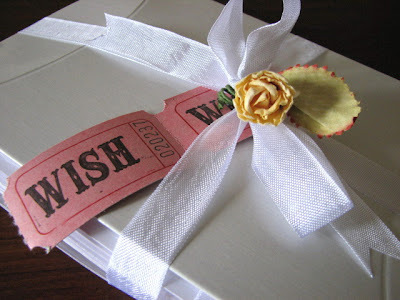 So beautiful : ) I won Aleta's Birthday Giveaway (she gave away presents on her birthday ~ such a sweet gal). You can visit Aleta's lovely blog here . Aleta is a talented Teddy Bear Artist, antique treasure hunter and photographer all rolled into one. 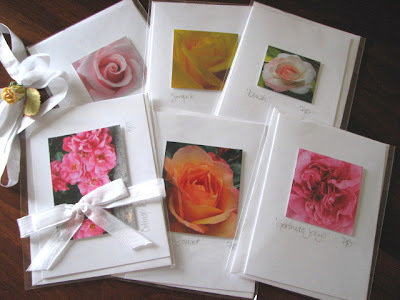 These lovely roses are images from Aleta's garden. Even the wrapping is pretty ! I love the two wishes . . . . I just might use them tomorrow. I turn 43 years old (shhhh) tomorrow ~ September 3rd. Congratulations on winning the giveaway! You got some lovely items! Happy Birthday Karen!! Have a wonderful fun day and make those 2 wishes good ones! Happy Birthday Karen and what beautiful cards you won. Oh, you lucky girl...Congratulations on winning the giveaway! Happy Birthday Karen! I hope you have a wonderful day. Happy belated birthday sweet Karen!